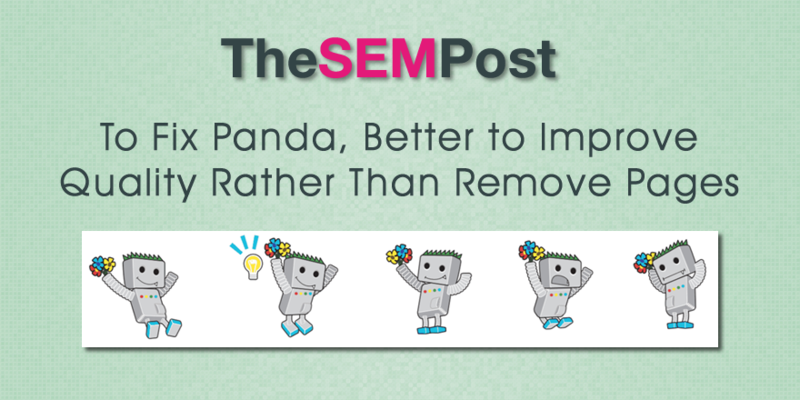 When it comes to cleaning up from a Panda penalty, many people will simply remove all the suspected low-quality content from a site rather than improving the quality on those pages. And it turns out that many people are removing good content and Google itself recommends that improving quality should be the solution to Panda, not simply removing it. The topic of content and Panda came up on Twitter over comments made at Pubcon yesterday. And Gary Illyes from Google says that they do not recommend removing content for Panda reasons, but instead add more high quality content instead. When it comes to perceived “thin content” on the page, it is better to increase the quality on those pages, rather than knee jerk and remove it all, as some people do as an “easy fix”. But you can easily lose pages that would perform well by removing pages too broadly. Illyes eventually said that Twitter wasn’t exactly the right place to have an in-depth discussion on various nuances, but did say that Google sees many people removing content that shouldn’t be. But when it comes to perceived “thin content” pages, there are actually pages that at first glance someone could say is thin content, but in actuality, it is content with value. While Marie Haynes was bringing up the example of single forum posts, there are examples of forums that do extremely well even with these types of pages – Stackoverflow was one example I shared. @Marie_Haynes @methode @shendison What about a site like Stackoverflow? They have a ton of no-response posts & they do amazingly well in G.
Which of course circled back around to quality content is key for a site to perform well in the search results. That said, depending on the content in question, it can sometimes be easier and less of a headache – not to mention faster – to remove the content, especially if the content is spam auto-generated or purchased 1,000 articles for $50. But it seems this should be reserved for clear cut spam cases, and otherwise, site owners should look to increase quality across all those pages. And back to the original point about 404 vs 410 for content that is removed, either works but Illyes suggests following it with noindex and sitemap. It is an interesting discussion on Twitter to read through – there were many other comments made by many industry people, but I did include all the related tweets that Illyes made.